Best in the Business Awards | Manhattan Chamber of Commerce. Our calendar provides a listing of all our sponsored and co-sponsored events, as well as non-Chamber events of special interest. Each November the Chamber hosts its annual “Best in the Business” Awards Breakfast. 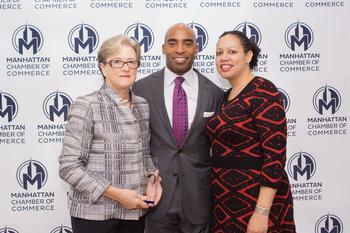 The event brings together 300 of New York City’s most influential business and civic leaders in order to recognize companies and entrepreneurs for their “above and beyond” achievements, community contributions and milestones. Most Innovative- Presented to an individual or company that uniquely filled an unmet need, sparked a competitive response in the marketplace and/or exceed market expectations. Legacy Award- Presented to an individual or company who, over the whole of his or her career, or company existance, has made contributions of outstanding significance in the world of business and beyond. Friend of Business- Presented to an individual or company who, by their words and deeds, has provided special and noteworthy support to the business community. Outstanding Corporate Citizen- Presented to an individual or company whose contributions have meaningfully improved peoples’ lives, embodying how business success and community involvement go hand-in-hand. Company to Watch- Presented to a company that is rapidly growing and evolving and/or has the potential to make a big impact on their industry. The next awards breakfast will be held on Thursday, November 8, 2018 at the New York Hilton Midtown. Click here for sponsorship details! Click here to view photos of the 2017 Best in the Business Awards! Click here to view photos of the 2016 Best in the Business Awards! Green Business of the Year: Mary Cleaver, The Cleaver Co. Retailer of the Year: Joy Toback-Galicki, Myron Toback Inc.
Small Business of the Year: Fatou Jabbie, USL Technology Consulting INC.
Restauranteur of the Year Award: Jean-Georges Vongerichten. Breaking Business Barriers of the Year Award: Howard Buford, Prime Access, Inc.